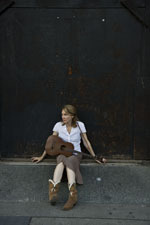 Diana Jones had released two finely crafted albums in the 1990s, but it wasn’t until she released “My Remembrance of You” in 2006 that she found her own voice and broke out of the singer-songwriter pack to emerge as a major figure in Americana music. She had discovered a connection, both biological and artistic, to the sounds of old-time Appalachia, unleashing her private muse and creating a record that landed on best-of-the-year lists in the Chicago Tribune and the Nashville Scene. Diana then landed the opening slot on high-profile European tours with Richard Thompson and Mary Gauthier and has been the featured invitee at folk festivals in Ireland, England, Rhode Island and Pennsylvania. One of her songs, “Henry Russell's Last Words,” has been recorded by Joan Baez, while another, “If I Had a Gun," has been recorded by Gretchen Peters. Diana’s own versions of those songs can be heard on her new album, “Better Times Will Come," an ambitious effort that consolidates and extends the leap forward of the preceding record. Diana’s fellow singer-songwriters certainly recognize the quality of her new work. Gauthier, Nanci Griffith and Betty Elders add vocals to the project, and the Old Crow Medicine Show’s Ketch Secor adds fiddle. The acoustic string-band arrangements, anchored by fiddler Alicia Jo Rabins, bassist Paul Kochanski and multi-instrumentalist Duke Levine, are deceptively simple, for their restraint reveals the haunting originality of the melodies and the understated skill of the performances. This reflects the deceptive simplicity of the lyrics, which tell their stories with the hypnotic repetition and plain speech of old mountain song. Pay closer attention, though, and you’ll hear a modern literary voice working with irony and implication. Listen, for example, to how skillfully Diana uses the subjunctive mood on her version of “If I Had a Gun," the conditional threat of a mistreated woman. Listen to how subtly Diana marks the passage of time in “Henry Russell’s Last Words," based on a real letter written by a dying miner. Hear how true love and undeniable defects can coexist on “Cracked and Broken." The lyrics are not strictly autobiographical, but they echo Diana’s own experiences.